Historian Don Farrell lent his expertise to the Public School System by giving a lecture last Thursday at Saipan Southern High School to 30 teachers from various public schools on how to effectively use his history textbook this new school year. Farrell’s Modern History of the Northern Mariana Islands is the PSS-approved textbook and he guided the teachers during the lecture on how they could explain the rich and colorful history of the Marianas to their students. The lecture is part of PSS’ professional development under the PSS Office of Curriculum and Instructional Services under associate commissioner Jackie Quitugua. Quitugua said they asked all of their teachers to report back to their respective schools last Wednesday to attend the various professional development workshops that are being held in different public schools on Saipan. “The PD is a plan under the Office of Curriculum and Instructional Services for our teachers. The contents are under the new curriculum and standards map that have been designed for the school year,” she added. “Talking to all these teachers, they are so grateful for the opportunity for learning through this PDs. Of course, we still have areas to improve on and we are paying attention to every detail,” said Quitugua. 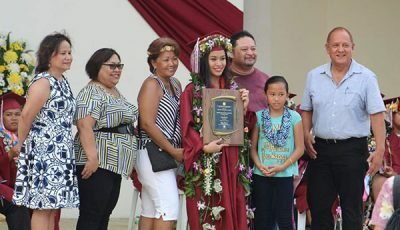 Mathematics, science, English language arts, Chamorro and Carolinian language heritage studies, and health and physical education are some of the other available courses.